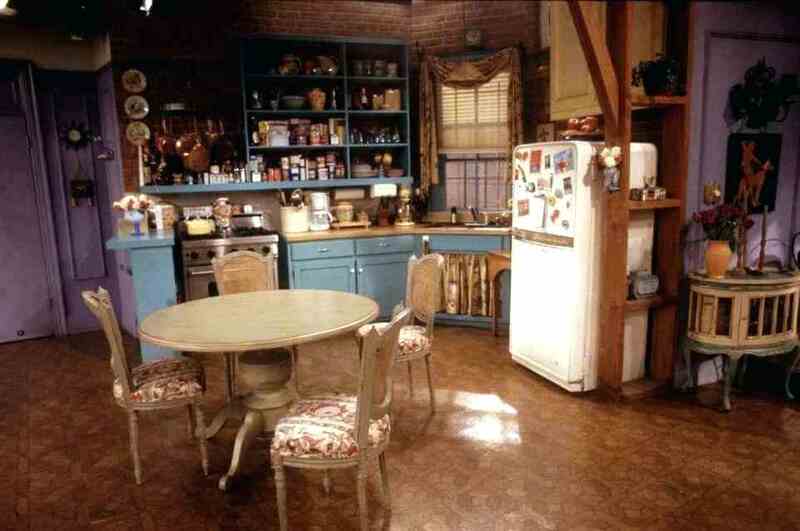 Many films and TV shows over the years have showcased some of the most memorable kitchens ever. From Home Alone to Friends, we love them all. When you think of famous kitchens, what comes to mind? We have assembled a list of the most iconic kitchens from the big and small screen, along with some inspiration on how you can bring these amazing movie sets into your own home. This kitchen is one many of us would love to retire to in the future. Having been the host to Cameron Diaz, Jude Law and Kate Winslet over the course of a memorable festive period, The Holiday is a festive favourite for many. This fairytale English cottage is beautiful in every aspect, and certainly provides a cosy feel, even through a screen. The traditional small kitchen has blue wooden cupboards running around the room. Adding in a rustic fireplace and cute table and chairs, completes this beautiful space perfectly. For a similar look and feel in your own home, a Cornell painted kitchen can bring the classic English countryside cottage style into any kitchen. Solid oak frame kitchens are perfect for creating a distinctive and high-quality traditional look. In contrast to The Holiday’s traditional cottage, Mr & Mrs Smith’s home in Pasadena is a luxury house in a suburbs. It is stylish and sleek, with all the modern features you would expect to see in Angelina’s own home. The combination of modern black cabinets and a kitchen island in the middle with marble top really showcases how the other half lives. It’s a bit of shame the entire house gets destroyed. To make your kitchen more like the Smith’s, try Integra handleless kitchen with a matt graphite finish. This kitchen provides a streamlined classy look that catches the eye, making your kitchen worthy of a few envious looks. One of the most distinctive kitchens ever to grace the big screen is Kevin McCallister’s in Home Alone. This house is home to a very big family, and in the first scene of the film, the entire family is gathered around the kitchen table waiting for the pizza to arrive. This is why the kitchen looks so big when it is just Kevin, who ends up defending it against the burglars. The kitchen itself has a homely and traditional feel, but as it was released in 1990, the decor is bound to look slightly dated nearly 29 years on. However, the combination of wooden cupboards, topped with tiles and replicated on an island is still a kitchen style that looks good today. A Rivington oak lacquered kitchen is a great example of a modern version of the McCallister’s. It brings a lot more light into the room while keeping with the original style, but with a more natural finish. 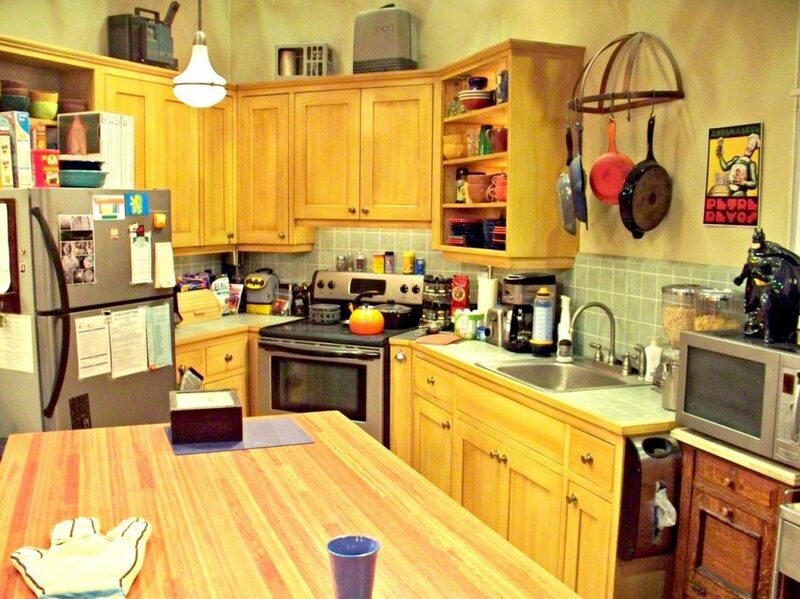 Still, the most successful sitcom of all time and with 10 seasons of the show primarily set in this very kitchen, could this kitchen BE any more iconic?! Such a small space that’s home to every pot, pan and utensil imaginable and Monica showcases that over many episodes. The blue painted kitchen cupboards with wooden surface tops, a white ceramic sink and stainless steel oven make up this television kitchen. If you were as broke up when the ‘Friends’ left the apartment for the last time as everyone else in the UK, why not recreate it in your own home? Another classic TV show that has now reemerged on Netflix under a slightly different name. The kitchen in this show had a traditional American style, with a white wood finish on the island along with the staple American fridge and tile finish. This kitchen was host to many spooky nights-in over the years. To bring this design into the 21st century try a Farringdon beaded painted kitchen with a porcelain and dark blue finish. This design combines traditional elements with contemporary finishes such as tongue and groove panels, and can be matched with over 25 different matt colour finishes. Now in it’s 12th and final season, The Big Bang Theory has accumulated a massive following made up of people of all ages. The success of the show has even led to a spin-off show, Young Sheldon. Set in an apartment block, Sheldon and Leonard live in an open-plan apartment with a kitchen and diner. The kitchen has wooden cupboards running along the top and bottom of one wall, with white counters and a large American style fridge. For a similar look in your own home experiment with a Broadoak natural oak kitchen. This attractive and stylish oak kitchen is made of solid timber and looks like the luxury brother of the Big Bang kitchen. American Pie isn’t short of renowned scenes across the various films in the series. Jim’s kitchen has been host to it all, including this scene from The Reunion – thank god for that pan! The kitchen itself is comprised of dark brown wooden cupboards with white tiled worktops and brown wooden cupboards above the worktops, and going around the kitchen. Have we missed your favourite kitchen from the big and little screen? Our range of kitchens has everything you need to create the kitchen of your dreams. Contact us today to see how we can make your kitchen the hub of your home you deserve, so you can start making golden memories of your own.